Starbucks will use its words and coffee cups to send a message to Congress about working together on securing America's future. 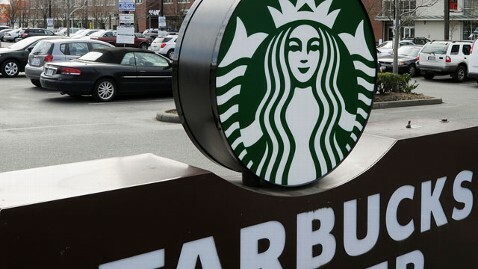 In an effort to prod the Democratic and Republican members to come together to create a responsible financial plan as the country approaches the looming fiscal cliff, Starbucks employees will write "Come Together" on every cup of coffee sold in its Washington, D.C., area stores. "In the spirit of the Holiday season and the Starbucks tradition of bringing people together, we have a unique opportunity to unite and take action on an incredibly important topic. As many of you know, our elected officials in Washington D.C. have been unable to come together and compromise to solve the tremendously important, time-sensitive issue to fix the national debt," wrote Starbucks CEO Howard Schultz in a blog entry posted on Wednesday. Schultz continued, "Rather than be bystanders, we have an opportunity-and I believe a responsibility-to use our company's scale for good by sending a respectful and optimistic message to our elected officials to come together and reach common ground on this important issue. " Last year, S chultz urged CEOs to halt campaign contributions until Congress and the president delivered a "fiscally disciplined long-term debt and deficit plan to the American people" and urged businesses to "accelerate job growth." Now, Schultz is sending a message that could ignite change. The message that Schultz' hopes will make a difference be written on Starbucks cups through Dec. 28. Congress and the president will be back in town tomorrow in a last-ditch effort to come up with a budget/deficit deal. This story was first reported by Politico.